Every service based industry provides service to their customer to retain them by taking AMC. AMC stands for Annual maintenance contract where the company charges some lumsum amount from their customer for specified product for a fixed period of time and fixed services. You can manage your amc service by using R Plus amc management software, to create new AMC go to add amc. When you select a client the software will automatically populate customer detail from customer master. You need to select the AMC period, it might be 6months, 1 year, 2 years etc according to customer’s interest. 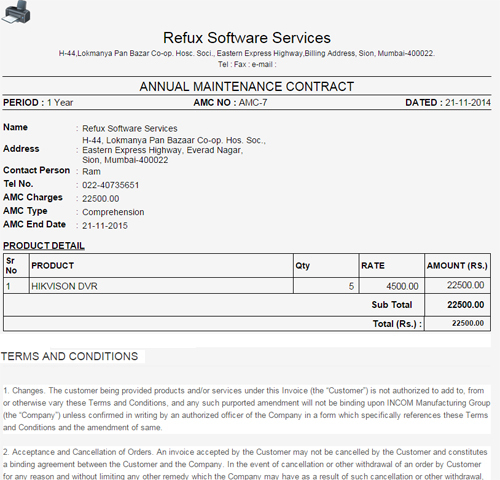 Specify the AMC start date, software will calculate the end date based on amc period. You can manage multiple terms and conditions against the customer. Enter the product detail which is under amc, mention the serial no to identify which product is under amc warranty. In note you can put the product location or any other detail related to the product for your reference. Enter quantity and amc cost per product. You can put the tax as applicable and the software will auto generate the amc agreement. In view amc you can find the number of client under amc. Also in dashboard you will get the amc service remainder to provide the service to customer on given time to keep the customer happy. When you add AMC an agreement will be automatically generated against the AMC. This agreement contract is a proof of new AMC for a particular time period. You can add multiple AMC terms and conditions in the master and you can use that while creating AMC. This will help you to maintain different terms and conditions based on client and product. When you create AMC, periodic services will be automatically created in the software. For eg. you have an contract with one of your customer for 1 year and you agreed that you will give 4 services. So the software will schedule 4 services for every 3 months in 1 year. You can see how many services have been schedule and for which customer. Software will remind you whenever the current date is near to the service date. So you can make sure that all service given to the customer on time. In dashboard you can see the reminders of AMC as well as AMC Service. AMC reminder will let you know what are the amc going to end, so you can ask the customer to renew the AMC. AMC service reminder will remind you to give service for the particular customer. AMC Management Software has smart summary in dashborad. This will have the summary of AMC or Annual Maintenance Contract, AMC Service and Complaints. You can see how many amc services are open and how many are pending. This will have summary of single service also. Also you can see how many complaints are open and how many complaints are pending. When you click on the link it will directly take you to the corresponding report. Graphical representation is a powerful message conveying technique which is used to summarize the message. In our AMC Management Software you can see the summary of complaints in graphical representation in dashboard itself. 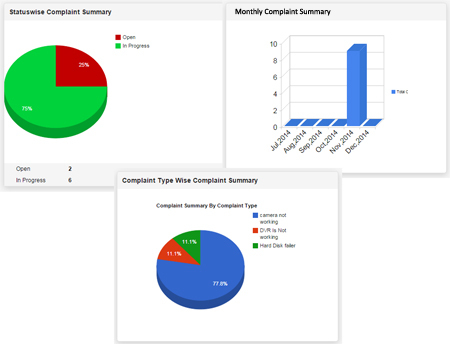 Statuswise Complaint Summary will let you know the number of complaints under each status. You can analyze how many complaints you are getting monthly using Monthly Complaint Summary Chart. You can categorize the complaints according to the type of the complaint. To do this you need to add complaint type in complaint type master. Whenever a complaint/ticket raised you need to select which type of complaint it is. This will help you to analyze which type of complaint you are getting many times. It is important know and understand the benifit of relationship with customer. To analyze this first of all we should know how much service we are giving to particular customer. Somtimes service provider gives more service and support to their client above their profit. Finally there is no use of having such customer as there is no profit. 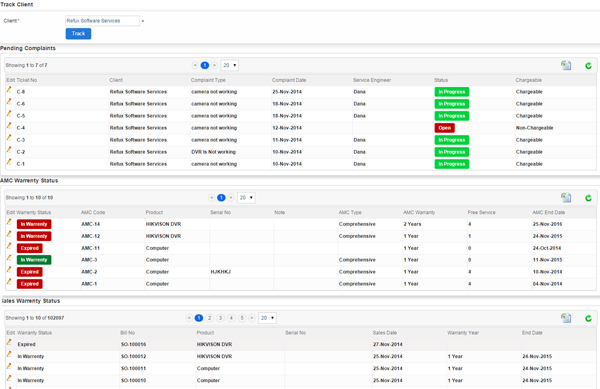 Our AMC Management Software will help you know all complaints,amc warrnty status and sales warrnty status in one click. When you sale a product you might give a warrenty period for the same. In this warrenty period any time customer can come up with issue to fix with free of cost. But it is important to identify whether the customer's product in warrenty or not. AMC management software will track the serial number when you sale. To do this you have to mention the serial number when you do sales entry. So the software will have the record of which product will expire when. You just need to select the warrenty period, it might be 1year, 2years etc. End date will be automatically calculated by the software. When the custome come for service we can check their serial number using track serial number. There are many reports to analyze amc, amc service and complaints. Find some reports below. Search amc by client, amc date, amc type etc. 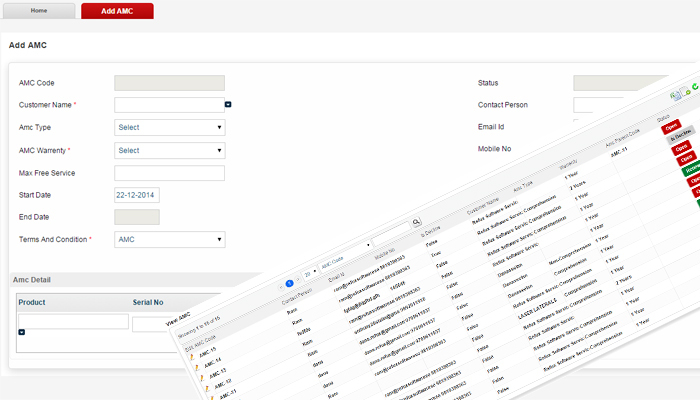 Search amc service by client, amc code, status, assigned to etc. Search complaint by client, complaint date, status etc. You can use the amc management software in any kind of industry where they provide service for a particular period. Take an example of CCTV business, the service provider will give free service after installation for a particular period. After installation the service provider should have a track of how many service we have to provide and how many are pending etc. If they are not able to manage this then customer will not be happy at the same time you can not increase the business from existing customer. So the conclusion is wherever there is amc agreement concept with customer or any service based industry can use this software to manage in a systamatic way. Your software hunting stops here.